West Virginia is on the eve of its second teachers’ walkout in less than a year. Only ten months after the state’s educators sparked what has now become a nationwide teachers’ revolt, a brazen attempt by Republican legislators to ram through a pro-privatization, anti-union bill has again set school workers on fire. Political developments are moving extremely quickly — it’s as if the months leading up to the 2018 strike have been compressed into a few short days. Like last year, word about the Republicans’ latest attacks on educators spread late last week over the West Virginia Public Employees United Facebook page founded by Charleston educators Jay O’Neal and Emily Comer. And yet again it’s the southern, coal-mining county of Mingo — with its proud traditions of labor militancy — that has taken the lead in firing educators up to walk out. Educators in other regions also met on Monday and more countywide emergency meetings are planned for Tuesday evening. It’s very possible that other counties will soon join with Mingo in organizing work stoppages. “Most of the teachers and school service personnel at my school are ready to walk,” notes Charleston’s Emily Comer. This resurgence of mass action in West Virginia has been sparked by Senate majority leader Mitch Carmichael’s attempt to rush through the passage of an egregiously anti-educator omnibus bill. Determined to get the legislation adopted before school workers have time to get sufficiently organized, Carmichael on Monday resorted to a blatantly antidemocratic parliamentary maneuver — not implemented in the state since 1961 — of skipping the Senate Finance Committee once it became known that he might not have sufficient votes within it. Carmichael’s legislation, made public only last Thursday, reads like a political wish list written directly by the Koch Brothers. Among a long list of regressive educational “reforms,” the bill would raise class sizes, legalize charter schools, introduce school vouchers, financially penalize strikers, undercut job seniority, end wage equity by introducing “differential pay,” and make it harder for unions to collect dues. In a cynical attempt to turn the public against educators, Carmichael has also folded the Republicans’ promised 5 percent pay raise, and increased allotments for the PEIA health insurance, plan into the bill. “Carmichael is trying to make it look to the public like he’s doing something good for us, when he’s actually cutting our throats,” insists Brandon Wolford, a special education instructor and president of the Mingo County Education Association. 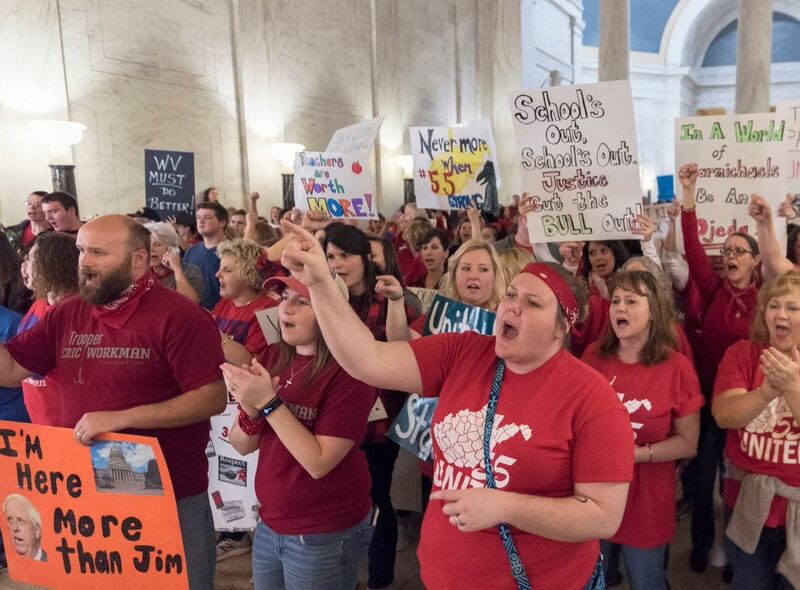 Most West Virginia educators see the bill as retaliation by Carmichael for the humiliating defeat he and the Republicans suffered in last year’s strike. Yet this legislation is also clearly part of a nationwide effort — likely financed by the right-wing Koch Brothers or ALEC — to roll back the momentum and gains of the teachers’ movement. Indeed, West Virginia’s omnibus bill is getting proposed at exactly the same time as similar legislation in Arizona and Oklahoma. This is now literally a struggle to save our public schools, which are the backbones of our community. We just watched Los Angeles teachers go on strike to fight against charters, which have drained funding from their public schools for decades. If we allow billionaire-backed charters to come into West Virginia, that’s what will happen here too. We’re already facing an education funding crisis, do we really want to deepen it by siphoning money off into private hands? The passage of Carmichael’s legislation would be a devastating and demoralizing blow not only to West Virginia public schools, but also to the national education movement sparked by last year’s strike. Unfortunately, the state’s top union leaders continue to lag behind the course of events. When asked about the possibility of striking, Fred Albert, president of the West Virginia American Federation of the Teachers, responded that “we’re not promoting any action of that magnitude at this point, but we are listening to our members.” For his part, West Virginia Education Association president Dale Lee was slightly more rhetorically bold, stating that anything “is on the table.” Yet like last year, the push towards workplace action, and towards cross-union coordination, is again being driven forward from below, at workplaces and over social media, by a “militant minority” of unionized rank-and-file teachers. After decades of labor movement retreat and working-class resignation, politicians like Carmichael and their billionaire funders seem to have convinced themselves that working people are simply too stupid or too weak to pose a credible obstacle to their profit-making plans. Presumably, last year’s strikes were a one-off phenomenon — now business can proceed as usual. But something fundamental has changed. Millions of workers are no longer willing to submit. In the political arena, this has found expression in the working-class electoral insurgency of Alexandria Ocasio-Cortez and Bernie Sanders. And on a workplace as well as community level, the deepening teachers’ strike wave — currently spreading from Los Angeles, to Virginia, to Denver, to Oakland — has put wind in the sails of working people in general and educators in particular. A year ago we had to reinvent the wheel, but now we know how to fight this. After what we accomplished last year, we’re aware of our power. So there’s no way we’re going to let the horrors of this bill be forced upon us, our students, or our state. We’re going to organize, we’re going to take action — and we’re going to win. What’s Behind the Teacher Strikes?